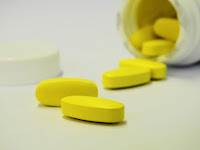 Today I'd like to take a look at the health benefits of Vitamin B5, also known as Pantothenic Acid, and share a list of facts about this vitamin. 1. Vitamin B5 or Pantothenic Acid is a water soluble vitamin. This means that unlike Vitamin A, for example, it does not build up in your system, but excess is flushed out through the kidneys in the urine. 2. Vitamin B5 is found in many things that we eat, but is most abundant in eggs, meat, legumes, avocados, whole grains, broccoli and yogurt. It is also in Royal Jelly, from a Bee of another kind. 3. When taking B5 in supplement form, it is best when taken with other B vitamins, this is true of any of the B Vitamins. 4. Since the vitamin is in so many foods and in vitamin supplements, it is rare that there be a deficiency, but if there is, the symptoms would include symptoms common to many conditions...fatigue and irritability; lack of it could lead to hypoglycemia, trouble sleeping, nausea and other common conditions...but since it is rare that it is deficient, it would not be the first thing I'd think of if suffering from any one of these symptoms. 5. It doesn't seem to cause harm if too much is ingested, and again, it is water soluble so what is not used is flushed out of the body. 6. According to information at Linus Pauling Inst. at Oregon State University, Pantothenic Acid is a component of Coenzyme A. They also provide a nice chart that shows how many mg. are found in several foods. 7. Wikipedia provides a nice chart that shows daily requirements for Vitamin B5 by age and other information that may not be listed above. 8. B5 benefits many things, but most information points towards it's benefit to the skin and hair.